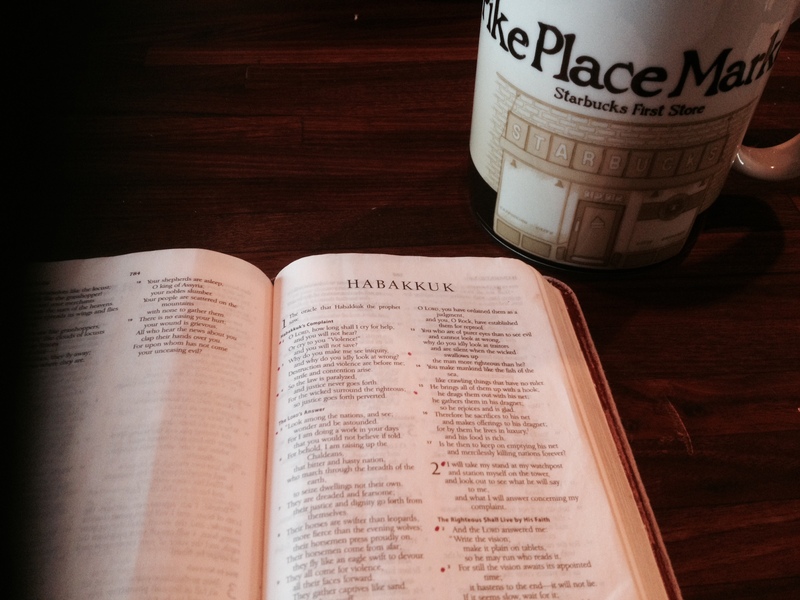 Sitting at Starbucks with an open Bible is a fascinating experiment. Now, let’s be clear. I’m not the experiment-with-an-open-Bible kind of girl. I wouldn’t call myself an evangelist, though I am an evangelical. So it wasn’t sitting open as an experiment, but because this girl needed to get out of her own office and off her own couch and the early morning led me to the land where I smell coffee but never drink it. Yep, I’m the girl who drinks tea at Starbucks. And really, I forget that life with an open Bible is becoming more and more of an anomaly. As Ihere in my grubbies and with my laptop before me, I wasn’t exactly screaming for attention. And my Bible is on the wee-side. A beloved relic from the days of yore when we sold everything we owned and traipsed around the world with a backpack. It’s small and handy. No neon sign attached. Yet it drew people. And conversations. Some that even included the f-bomb. From me. Yeah, that happened. In Starbucks. While I described Week 4 of Friday’s Rain. Read it and you’ll see why. You know, honestly, a lot of times it’s not. But that day it was. And it wasn’t just open. So was my mind and my heart. Writing a Bible Study is no joke, folks, and while I had certain ideas from here and from there, the coolest thing has been to remember just how ALIVE God’s Word is. To explore it and search it and listen for what comes next before I write it down. Powerful stuff. And that’s basically what I told the young guy who asked me about why it sat there open before me. He’d never read it. He asked thoughtful, intentional questions. This is a season in my life, you guys, where God is teaching me that He’s the God who goes before us. Even in something as simple (and miraculous) as spending the morning learning the specific answer to a precise question that was still hours away from being asked. I want to live my life with more open-Bible days. It’s not enough to carry it in my purse. The real power of God’s Word is when it’s open. Amazing things can happen with an open Bible at Starbucks. You should try it. But don’t be the person who uses it as an experiment. Actually open it’s pages for you. Because maybe you need to hear something specific, or maybe the guy who’s going to sit down four hours from now does. Or more probably, both. Amen! Love and miss you friend!